ORCHID CHEMIE is dedicated towards providing high finest quality chemicals to the clients. 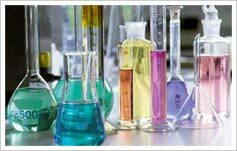 Our wide range of chemicals encompasses Butyl Acetate, Ethyl Acetate, Dipropylene Glycol, Ethanol, N Butanol, N Propanol, Stearic Acid, Refined Glycerine and Soap Noodles. Our products are highly demanded in the market owing to their excellent composition and varied uses. We are committed to serve a vast clientele in various industries like Printing, Packaging, Perfumeries, Cosmetics, Food, Soap, Pharmaceutical, Automotive, Paints and chemical processing.